‘ right on what I would map out as the night time coyote trail. 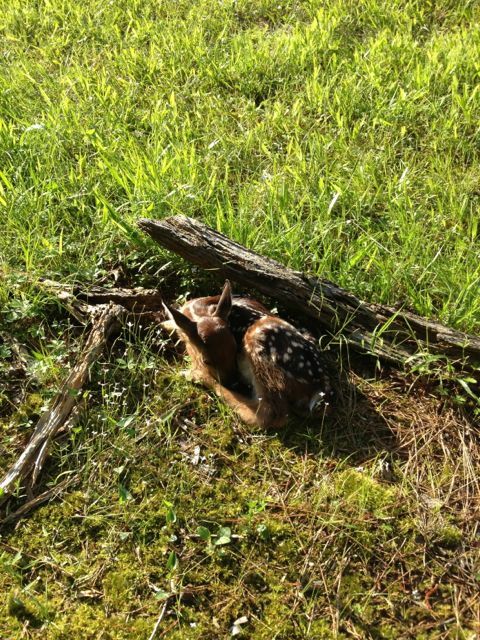 Even though we knew that wild animals should be left for their mothers, I was convinced that this little one wouldn’t make it and if left there, would be ‘thrown to its predators’. My maternal instincts wouldn’t let me walk away when ‘the dark was coming’ as our firstborn used to call the beginning of nighttime. Fastforwarding to today, after sleeping with a hot water bottle in our laundry tub, I began feeding her a bottle of ‘deer colostrum’ from a baby bottle. After a few swigs, she was up and wobbling, eager to get out of the little green tub. Not wanting to restrain her, I watched as she climbed out and all four legs slid sideways out from under her. Little Mossy, as I began to call her was then ready to go after the bottle again. I took her out to our covered pen in the woods where we used to keep our giant lop, Potato. She guzzled the rest of her bottle, almost climbed in my lap, ending up curling in her sweet little ball on the ground. Little did I know that I was already quickly bonding with this little creature, and after checking with neighbors and studying more about fawn raising, I was content with devoted next days toward nurturing Little Mossy until she was able to eat grass and fend on her own, and then do what our neighbors had done, gradually introducing her back into her wildlife setting, and then getting adopted by the herd of deer that shares our two yards and gardens! I was content with a new ‘babe’ to nurture, until…until Alex came home with the resolute ‘right thing to do’. He, too, had researched and talked with wild animal savvy people, and strongly suggested we take it back down in the meadow, not feed it so that it would make sounds looking for it’s mother, and let it go. I wasn’t ‘easy’ to bring around, not without flailing my own dear legs and ’emoting’ a bit. I cleaned up a whole area by the studio just to vent my frustration and to exercise my ‘NO’ for a bit before I came around to marching down into the meadow sadly to let her go. I’m in the middle of the drawing/inking process of this page. Usually, I don’t get around to posting in the middle of things, but I’m trying to be better about posting once a day. 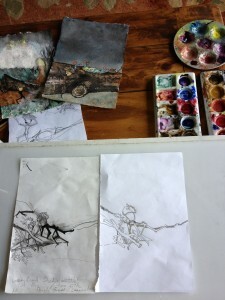 Rather that rush through the process ‘just to get something posted’ I’m choosing to split things up to let my hands (and the rest of me!) take a break in between. 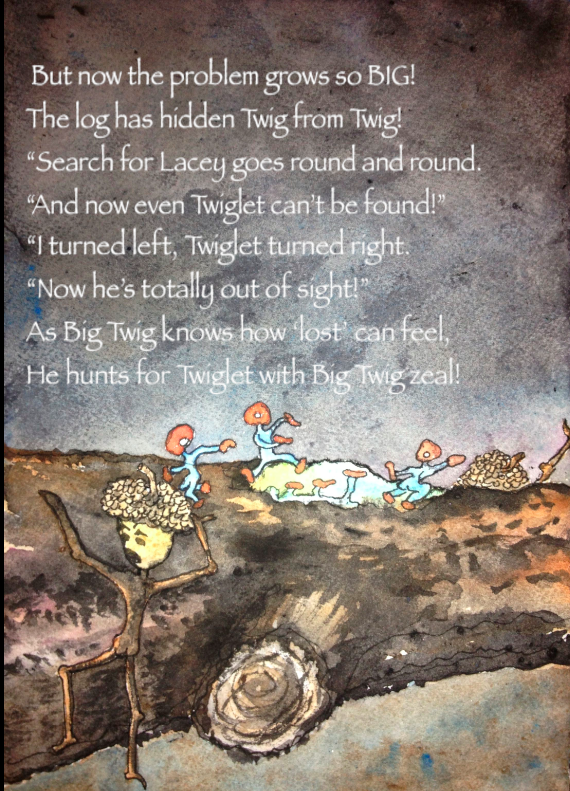 Big Twig is getting weary on his search now for BOTH Lacy Leaf AND Twiglet. As he looks at piles of twigs and leaves, he envisions what might happen to HIM if he doesn’t make it back into his tree by dawn, which is coming sooner and sooner! 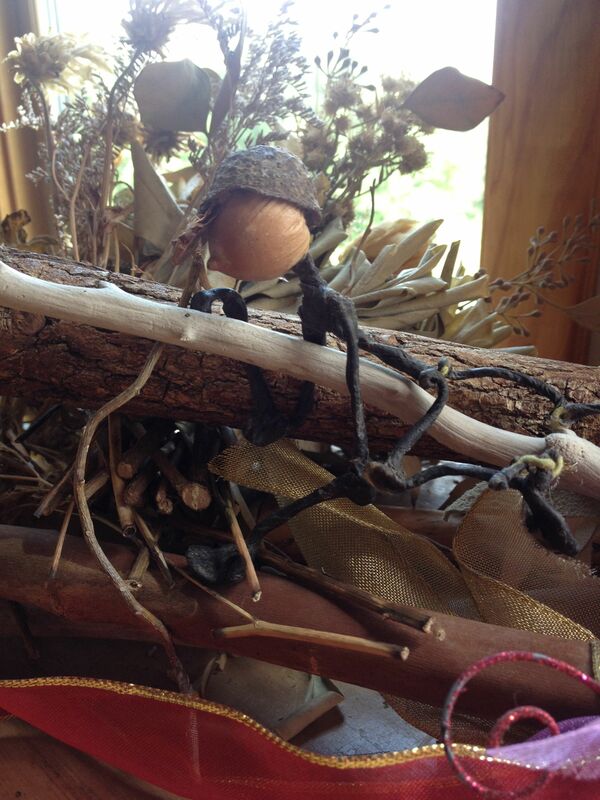 I gathered sticks and twigs that were actually in the house and tried positioning one of my twig people on them to help me visualize my drawing. Now I’m at the point of putting my drawings on a lightbox and creating an ink drawing on my watercolor paper. Already hands are getting numb-er, so I need to work quickly! Been getting ready for a Family Fairie Gathering at The Hillocks, meanwhile, the little Twigs have been on their quest for Lacy Leaf! They and I have been stuck with how to get around ‘the log’ in our paths! 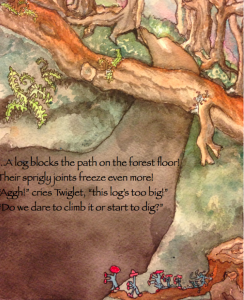 Their ‘log’ is a true ‘log’ along with whatever obstacles they also create in their minds about it! My ‘log’ is most physically my ‘numbing hands and fingers’ and mentally ‘the storyline coming up is not satisfying to me (and perhaps to the readers? )’ and logistically ‘I’ve so much to do to get ready for this event!’ As is Twiglet hiding from Big Twig’s view, so is magic hiding somewhere in this illustration…it just hasn’t surfaced yet….back to the tweaking board! As night skies darken, stars come out and fog thickens. Dawn is waiting for it’s time to highlight the magical breaking of a new day! Learning to paint all these different moments in our daily and nightly lives is very humbling…humbling that we have the opportunity to participate in all these changes of light and darkness and mist and fog every day of our lives if we just participate and behold the displays of nature as they happen. Paintings can’t do justice to the awe of it all! Mist and fog are setting in during the Twigs’ time down on the earth. Took me two days of studying misty fog and adding night time to come up with this painting. The text still may get tweaked later. The darker it gets, the more difficult to use colors…we’ll see, or maybe we won’t see what happens as it gets deeper and deeper into the night! For now, there’s a glimmer of moon or starlight somewhere glowing through as the mist begins to settle in. 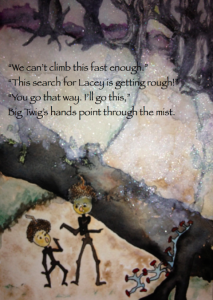 I probably have more different images of this fog than any other setting in the story! The First Poppy of the Season! 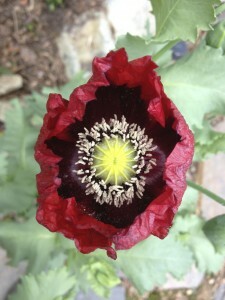 Every spring I so look forward to the first poppy blooms! Here’s the one for this year! 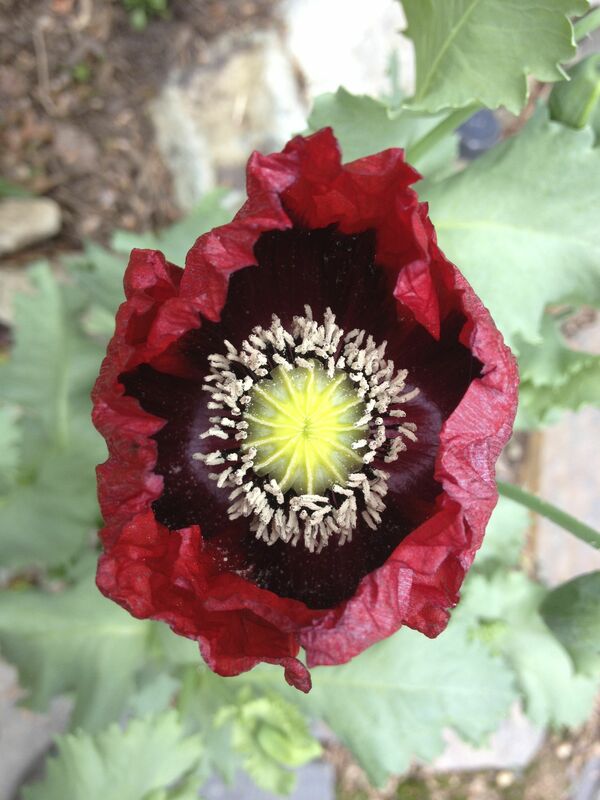 My garden has poppy plants popping up all over the place! In another week or two there will be so many! 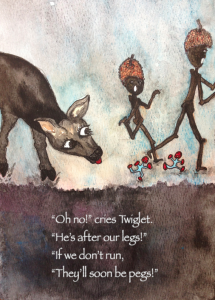 Been spending a lot of time and thought on the text to this story, tweak, tweak, tweak the twig story! And I’m sure I’ll tweak some more! 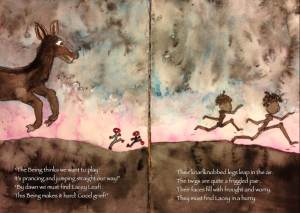 For now the text is as it is in its evolutionary stage… Tried some different watercolor paper I had. Much better quality paper. Lots of adjustments for me because it seems to take the color and the water differently. And seems to dry out faster so I have to work faster before the colors set! Something about the log seems still a little ‘flat’ but I loved experimenting with the colors! And added some more lichens (cladonia crystatella, I think). 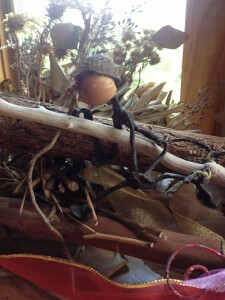 These little guys are on the sidelines to cheer on Big and Little Twigs’ sidekicks. (is THAT where that apostrophe goes?) Guess it would be nice to have an editor besides ME! Not sure how the perspectives from the page before match up if this and the previous page were to become a double page spread. Anyway, the plot thickens, as will the darkness! Perhaps I’m getting tired along with these Twig Guys as they run fast to get away from ‘the Being’! Or perhaps I’m tired of tweaking this text and not being satisfied with the complete story. Or perhaps I’m just ‘tired’ and am wising up to my non-nurturing habits of staying up wee hours until I can get my page of the day to come round right! Truth is that some pages just take longer, and after spending my energies on a page, I find little left to go through posting logistics. 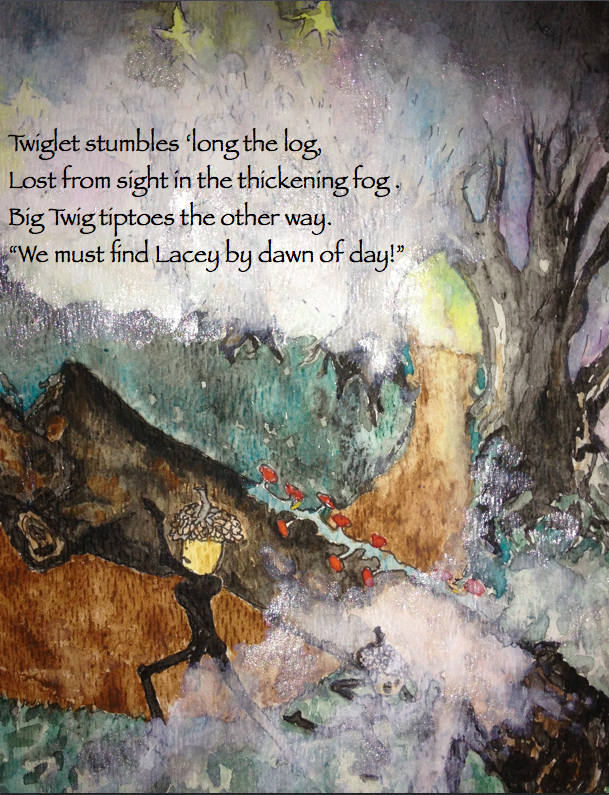 Big Twig and Little Twig seem to be almost over this hurdle with ‘the Being’ if they can just ‘move on’ to finding Lacey Leaf! I remember days of writing term papers in college and how hard I tried to discipline myself. I became very disciplined at washing clothes, sorting through papers, and cleaning up! Often I would ‘fuss at myself’ for not being disciplined and stifle my creativity even more! And as a teacher, I would end up with a clean classroom, way before I would finish my reports or evaluations. And then there was the teaching year I decided that parents would much rather have drawings of their children than pages of written evaluations! And now…today I found many ‘disciplines’ to exercise as the twig characters in my growing book, get frozen on their page along with words that I can’t seem to find for their next crisis. Today, my ‘discipline’ was weeding! I weeded til my fingernails grew dirt and with courage and zeal to dug deeply into the dirt with no age old fears of snakes. The flowerbeds are nearly as immaculate as the next empty pages of this book! Yet what I’m learning is that this also is part of my process…sifting through ideas, weeding out ones that won’t work, and clearing away all the extraneous clutter in my mind that’s between me and the result I’m wanting to create. So ‘no fussing’ at myself this time. I’m trusting the twigs to show me next moments in their twilight adventures. And I’m trusting that they will make it back into their wise old tree before dawn. So as the weeds pulled easily from the wet dirt, and the rains soaked me and the dirt, I’m trusting that we are reaching the saturation point and that tomorrow will be a new day… for scattering seeds onto the fresh moist dirt, and sprouting healthy ideas for the fresh pages before me! Sleep well! So now I’ve added the texts to this ‘double page spread’. Somehow it doesn’t fit and I think it’s quite redundant. For now, I think I’ll continue with the story and see how things unfold. For sure, I know I’ll either end up changing the illustrations or the text, or perhaps both! agggh! I think something will naturally ‘self correct’ but if not, I’ll tweak again and again until it comes round right. I’m also not sure how this will post, since it will probably post as the same size and a single page. So much to learn!